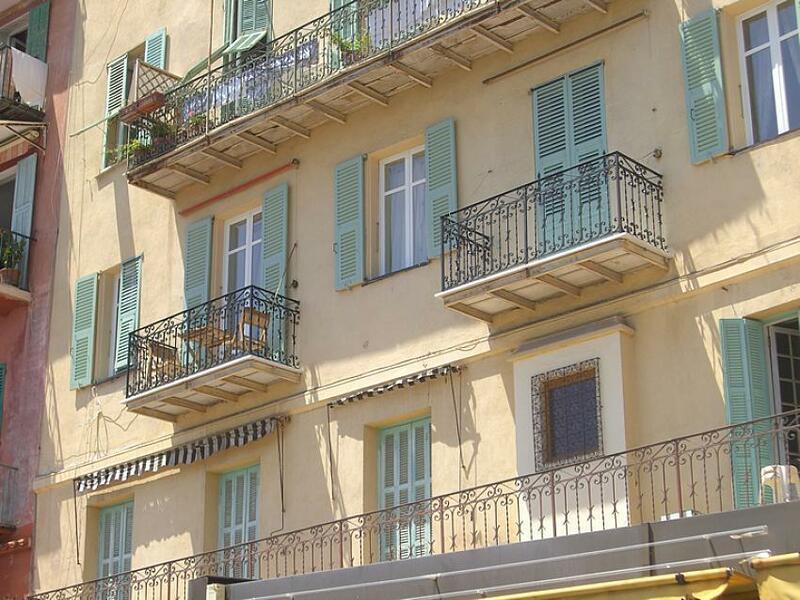 Possibly the best apartment in Villefranche. Seagulls is located in the very centre of the Port in the Old Town of overlooking the bay. It is a one minute walk to supermarket, bakery, fruit stall, shops, restaurants etc and is fitted out in total luxury with 5 windows overlooking the front. Sun enters directly into the main bedroom and lounge at dawn and the two balconies get sun most of the day. Very quiet (Double glazing), oak floors, pink marble showers, Provencal furniture, sofa bed , this apartment is perfect. It is built over the Rue Obscure which is one of the oldest unchanged streets in France (1420). The Old Town of Villefranche is a genuine living village and there is a drinking well outside the apartment. The 3-bedroom apartment is very large and has is a U-shaped layout. Built in 1820 (and traversing Rue Obscure, dating from the 13th century) the entrance has Bedroom 1 to the left (2 single beds), then a fully fitted Kitchen with a basement off, housing the air-conditioning, ironing, washer and dryer. Beyond the lower hall is the main room. Bedrooms 2 and 3 each have huge sleigh beds with en suite bathrooms. The main bedroom has 2 windows overlooking the port. Everything in the apartment is new, with a very high standard of furniture, bedding, curtains, fabrics, flooring etc. The 3 bathrooms are clad in pink Portuguese marble and the main bathroom has a high-back bath at the window overlooking the port! All bathrooms have walk-in showers. Floors are Oak and the furniture is French Provencale style. The kitchen is Cream Provencale with a tiled floor. The total area is c. 2400 sq. feet making this the largest apartment in the Old Town. General Items: linen & towels provided - air-conditioning - central heating. Bedrooms: 2 en-suite double rooms (one with balcony) - 1 twin room (2 single beds). Bathrooms: 3 bathrooms, all tastefully clad in pink portuguese marble. Bathroom 1: Overlooks port, WC, bath (standalone, overlooking port! ), shower, bidet. Bathroom 2: WC, shower enclosure, bidet. Bathroom 3: WC, shower enclosure, bidet. Kitchen Items: Fridge - freezer - hob - oven - dishwasher - washing machine - drier. Living room: Sofabed, living area seating for 8 people. Dining room: Seating for 6. Entertainment: Hi-Fi - Satellite - TV - video player (PAL). The location is unbeatable as it has 5 windows to the front (+ 6 at the back) and there are no stairs to climb. There are 2 balconies to the front. One is fitted with table and chairs. All ceilings are high as it was constructed from 3 old apartments made into one! The main building dates from 1720 and Rue Obscure (underneath) from 13th century. The basement has a separate entrance for bicycles etc if required. Although the apartment is on the second floor from the port side, the entrance is on ground level from Rue Poilieu, meaning that there are no steps and that this apartment is suitable for the infirm. A car is not necessary in Villefranche. However there is a public car park 120 yards away (€ 8 / day) and a free car park on the old Citadel (300 yds away). D’ARSE where here is a small beach and old vaulted galley-slave pens. The main CHURCH in the old town has a wooden sculpture carved by one of these slaves. Casino supermarket, bakery, newsagent in Rue du Poilu which is street behind waterfront. Also shops up on Basse Corniche , below Villa Semiramis. BOAT HIRE on waterfront through ‘Dark Pelican’. No license needed if one hires a small motorboat. There is a public parking lot nearby the property at around €15 per day.